Although my introduction to Asian cuisine has been somewhat limited, my move to San Diego will, I believe open up my eyes and allow me to gain an appreciation for this food style. I am not referring to the typical Asian food seen in all you can eat buffets. This type of cuisine is prepared by Asian Americans for consumption by their fellow Asian American neighbors. Dim Sum is a style of eating which closely resembles the style of Spanish tapas, meaning that it is served in small portions with the intent of the consumers ordering many dishes. This allows a person to try several dishes which will fulfill their various hungers in one setting. Hong Kong BBQ and Dim Sum is nestled in the front corner of the Vinh Hung Market in San Diego. The restaurant is consisted of a little more than a dozen tables and a glass fronted warmer box like the ones seen in delis. In display box there were many of the commonly seen Asian dishes, such as Mongolian beef and lo mein. Next to those dishes were the items that first drew me into this small eatery, the hanging Peking duck and whole roasted pig. In my adventures, I have learned that any restaurant which happily displays some sort of roasted meat tends to provide a promising meal. Sandwiched in between the lo mein and the roasted meats were something that I have never encountered. They were multiple stacks of what appeared to be aluminum dishes which I suspected were used for steaming food. After being seated, the server produced a large and varied menu which made my mouth water as I looked over the many selections. I noticed the dim sum section squared off in a small corner of the page. 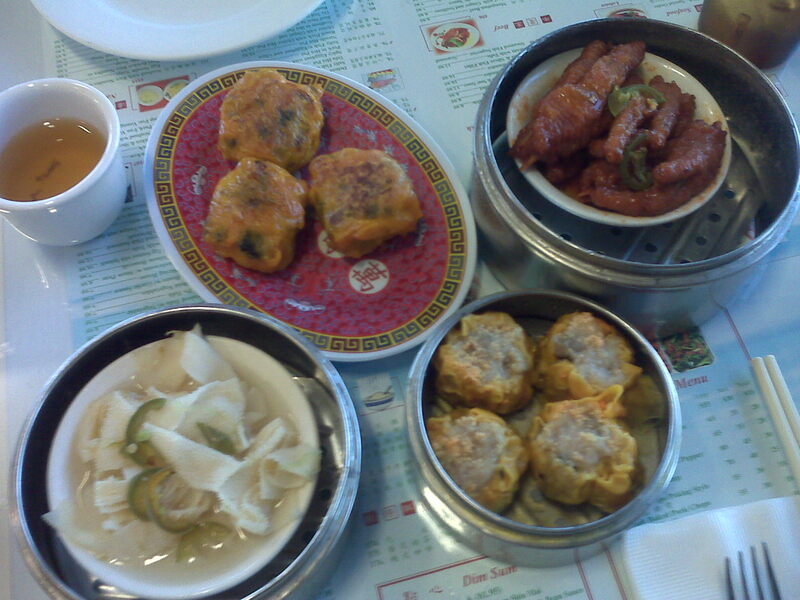 To my recollection I had never eaten dim sum but I knew of the origin and style. I began to browse the choices in that area. Steamed spare ribs in black bean sauce, Steamed BBQ pork buns, and Taro Cakes were just some of the many selections. My partner in culinary crime and I each chose two dishes from the dim sum selection. I chose the Pan Fried Vegetable Cake along with the Pork and Shrimp Shiu Mai while he chose the Stewed Chicken Feet and Ginger Scallion Beef Tripe. We then asked the server for an off the menu item, something consisting of just green vegetables. She suggested the Chinese Broccoli with Garlic. Much to my surprise the dishes arrived within just a few minutes. They were all contained in the very same metal steaming containers seen at my arrival. The only exception was the Sautéed Chinese Broccoli which was prepared to order and then brought out on a serving plate. What now set in front of us was something out of an East Asian travel documentary. Multiples of food stuff which looked delicious and intriguing all in the same instant. Despite its name, the Pan Fried Vegetable Cake was not solely prepared of vegetables. Located inside the fried doughy pastry were a number of tender vegetables, which included cabbage, and what tasted like tender, cooked to perfection, ground pork. Once I bit into this little delight the juicy flavors which were produce by the coupling of the pork and the vegetables is something that leaves my mouth watering as I write. The Ginger Scallion Beef Tripe, although not a personal favorite, is something I believe should be tried once just because of the amazing flavor produced by the combination of the minced fresh ginger and scallions. The tripe took on this flavor which, if one can get past the texture, should prove to be an enjoyable dish. There were no flaws in its preparation method I might add. I am just not a fan of this particular organ. Pork and Shrimp Shiu Mai is a traditionally Chinese prepared dumpling which consists of an interior of ground pork, diced shrimp, and black mushrooms. My only comparison would be a meatball wrapped in semi-transparent dough which is seasoned, then sealed, and then steamed to perfection. This method retains all the juices in the interior of the dumpling which provides for an explosion of delicious flavors when bitten into. Stewed Chicken Feet are something which is normally shunned in American culture. But, being the adventurous sole that I am, I opted to try it. The experience was not a regrettable one either. The feet were stewed in a spicy orange and red colored sauce which consisted of, what is suspected, to be a combination of peppers and their juices. The meat which was contained in the feet was a tender and cartilaginous delight once you got past the fact that your lips burning from the sauce. Last but not least is the Sautéed Chinese Broccoli with Garlic. This enjoyable combination of basic flavors is still one of my favorite dishes of that day. The Chinese broccoli, unlike typical broccoli has broad leaves and a longer slimmer stalk. When prepared in the above method, the leaves remind me of a more crisp tradition green, a little like cabbage but better. The stalk of the Chinese broccoli tastes almost identical to that of the traditional broccoli consumed in the United States. The pairing of the broccoli with the sliced garlic and the garlic infused oil provides an amazing, yet uncomplicated, grouping of flavors that should satisfy even the weariest of eaters. The combination of tastes and the overall delight that is experienced with eating this type of cuisine has the tendency to remind one of the many years of evolution which has lead to these types of enjoyable dishes. Thousands of years of production and fine tuning coupled with the food style’s journey across the Pacific has rendered what I experienced that day, a truly enjoyable and satisfying meal.